In October 2004 we went on holiday to Hurgada, in Egypt. There was some good wind blowing down the Red Sea and I made some progress on my wind-surfing. 'Progress' being going very fast without falling in too often. There were some crows there that looked an awful lot like the hooded crows you get in these parts. That was surprising, since I thought they were a northern phenomenon: in the British Isles you find them in Scotland and Ulster. While we were there some bunch of idiots blew up a hotel on Sinai and killed a lot of people. So we got a couple of text messages asking where we were and if we were all right. My researches indicate that it was a Corvus corone pallescens, as reported seen several times in Egypt by a somewhat obsessive birdwatcher from the Ornithological Society of the Middle East and listed among the inhabitants of Ras Mohammed. 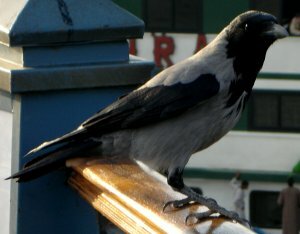 The Northern hooded crow is a Corvus corone cornix, thus both are sub-species of the carrion crow, Corvus corone corone. Although some have recently claimed that cornix should be classified as an independent species, Corvus cornix, this is controversial. See Putni Latvija for a discussion of the arguments (scroll down for English if your Latvian isn't up to scratch). If the classification as an independent species is accepted, then the Egyptian one should be classed as Corvus cornix pallescens. Infomia suggests that the hooded crow separated from the carrion crow as a result of the ice age, as does Wikipedia. Polish Wikipedia confirms pallescens as the Egyptian sub-species and tells you where to find the others (sharpii, capellanus and sardonius), while an Israeli stamp collector goes into more detail on the distribution of the various subspecies. The map of the distribution of Corvus cornix on wikipedia is not entirely accurate (it doesn't include Hurghada, where I saw it, or the Sinai peninsula) but clearly indicates that outside the British Isles the split between the carrion and hooded crow is not primarily North/South. (In fact, it isn’t even primarily North/South in the Britsh Isles.) Infomia gives the Elbe as the dividing line in Germany, for example. So I shouldn't have been surprised to find a hooded crow so far south. There are pictures of hooded crows in Israel and other places at http://www.digimages.info/corman/corman.htm.